Wilson Kipsang has won the men's London Marathon for the first time. The Kenyan added to his success in Frankfurt last year, finishing ahead of Martin Lel and Tsegaye Kebede. Kipsang made it a Kenyan double with victory in an unofficial time of 2:04.44, just four seconds outside the course record set last year by Emmanuel Mutai. 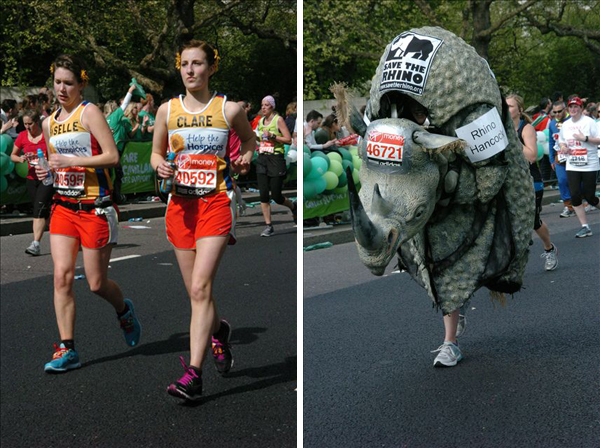 I really enjoyed my 7th time covering the London Marathon. The weather was a little warm and sunny early on, which was great for some press and PR photography. However by mid-afternoon, as predicted, the heavens opened and it rained heavily. Quite a few runners and spectators were unprepared and some of the fun-runners towards the back of the field went past me with silver-foil blankets wrapped around their shoulders. Great atmosphere at the London Marathon, in particular where I was located on the Embankment - everyone, from runners, to stewards, to charity folk and crowds, were so friendly, it makes working long hours easy. As usual took over 10K of images, so just a few of my favourites below.